Nicole has been wandering around the woods and turning over rocks for as long as she can remember. Having grown up in Austin and roaming the Barton Creek Greenbelt instilled a curiosity and passion for nature at a very young age. 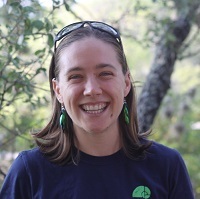 After graduating with a Bachelor of Science and Arts in Biology from the University of Texas at Austin, she quickly realized that the most meaningful thing for her to do with this degree was to share all of the wonderful things she had learned with as many people as possible, preferably by teaching outdoors. Working as a Program Assistant at El Ranchito for the last several years has helped fulfill that desire to encourage curiosity and respect for nature with both youth and adults. Living on a 206-acre ranch near Westcave has kept nature and conservation on her mind, and Nicole is excited to share her enthusiasm and curiosity for the land through Westcave’s educational programs!